Suki Nijjar scored twice for Southam but it was not enough to earn them their first win of the campaign. Southam dominated much of their match at home to a reshuffled Pelsall Villa but, despite creating numerous chances, they could not hang on for a first Midland League Division One win of the season. Debutant Dave Evans shot straight at visiting keeper Adam Jenkins when played clean through in the 21st minute, while Mark Ling fired just over and Lee Rycroft’s free-kick went narrowly past the angle before Saints had a gilt-edged chance to break the deadlock in the 35th minute. 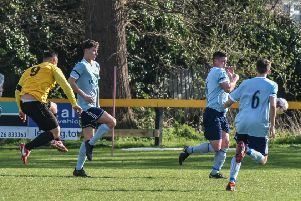 Suki Nijjar was brought down from behind for a clear penalty but Ling placed his spot-kick against the foot of the post with Jenkins having dived the other way. The elusive breakthrough came in the 43rd minute when Nijjar was released and gave Jenkins no chance with a powerful shot. An immediate lapse of concentration from the home side almost allowed Pelsall to equalise and it took a fine save from keeper Simon Reading to ensure Saints went in at the interval ahead. Reading again had to be at his best early in the second half as Pelsall looked to push on more but Southam were still creating chances at the other end, with Nijjar only just wide after being played through by Deakins. In the 69th minute a long ball from Rycroft was flicked on by Josh Turton for Nijjar to race on to and calmly beat Jenkins for his, and Saints’, second. Pelsall were gifted a way back into the game in the 74th minute when an easy through ball beat the Saints defence, allowing Josh McFarlane to run on and reduce the deficit. Southam should have restored their two-goal cushion, Nijjar hitting the bar with Jenkins beaten and substitute Josh Marshall blazing over a gaping goal. Saints were made to pay two minutes from time when a needlessly conceded free-kick was floated into the box and the resultant scramble saw the ball crash into the net off a Southam player. It could have been even worse for the hosts, with Jenkins making a superb reaction save to deny Dylan Timms what looked a certain goal. Southam travel to Coleshill Town’s artificial pitch to take on Chelmsley Town tomorrow.